You do not have to download ebooks in order to read them. You can read ebooks online at anytime without downloading the book or Adobe Digital Editions. (Click "View this eBook.") Downloading ebooks is recommended for users who want to read an ebook while offline, or for users who want to transfer to an ebook reader. These instructions are for EBSCO ebooks only. Other databases containing ebooks may not be available for download. Not all ebook readers are compatible with Adobe Digital Editions. Click here for a list of compatible devices. Instructions on how to download software and create the necessary accounts are provdied below. Note: These instructions were created for a PC/Windows 7. Both Adobe Digital Editions and EBSCO eBooks are Mac compatible. Adobe Digital Editions allows you to download and read ebooks directly from your computer or ebook reader. When an ebook is checked out and downloaded, you can access it without being connected to the Internet. You must download Adobe Digital Editions software and register an Adobe ID before checking out and downloading ebooks. Follow the step-by-step instructions below to get started. If you are already an Adobe Digital Editions user, skip to the EBSCO download instructions. If you have an EBSCO account enter your user name and password. 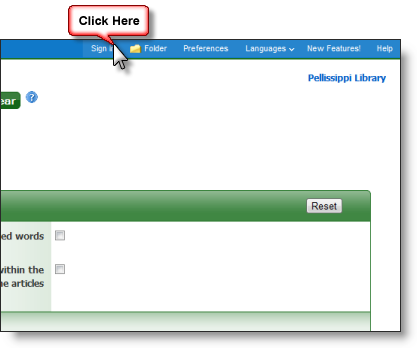 If you do not have an EBSCO account click Create a Free Account and follow the steps to create your account. Once signed in, you will be redirected to the search page. 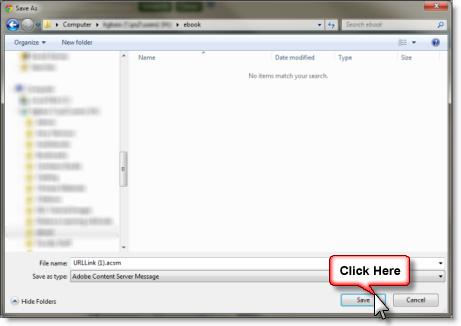 Enter your search terms in the search box & click Search. To browse ebooks, click the eBooks link at the top of the screen. 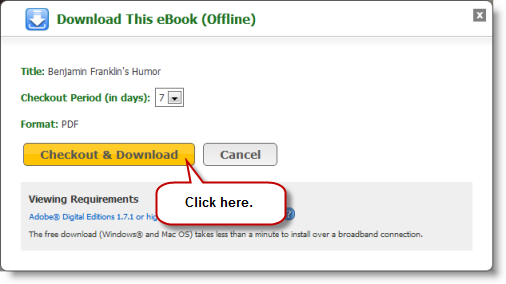 When you have selected an ebook, click Download (Offline). 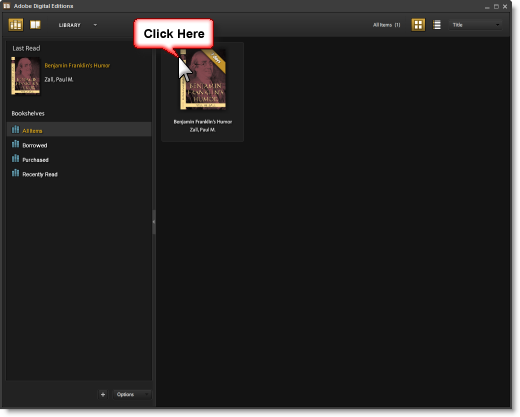 Click the yellow Checkout & Download button. eBooks are checked out for up to 7 days. If you'd like to check out an ebook for fewer than 7 days, use the Checkout Period drop-down menu. You should see this confirmation screen and be prompted to download the ebook file. If you do not see this screen, check that you are successfully signed in to My EBSCOhost. 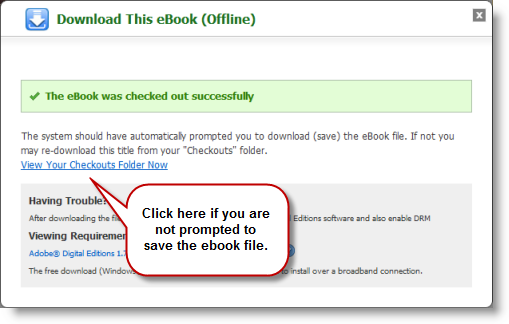 If you are not prompted to download the ebook file, click View Your Checkouts Folder Now to download the ebook. Choose Open to view the ebook immediately in Adobe Digital Editions. Choose Save if you wish to transfer the ebook to an ebook reader, or if you'd like to view the book again later on the same computer (without having to re-download). It is not necessary to rename the file if you choose to save it. If you chose Open, the ebook should open automatically in Adobe Digital Editions for offline reading. 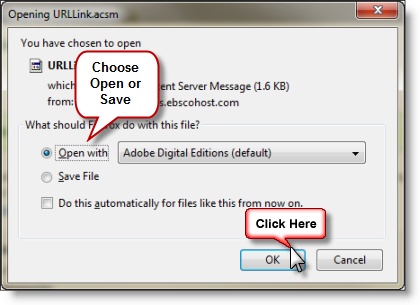 If you chose Save, you will be prompted to open the file in Adobe Digital Editions when the download is complete. (If you are not prompted to open the file, you may need to navigate to the location where you saved the file to open it.). Double-click the book's cover to begin reading.